In my last post, I explained that social media data can be used to bolster PR efforts. 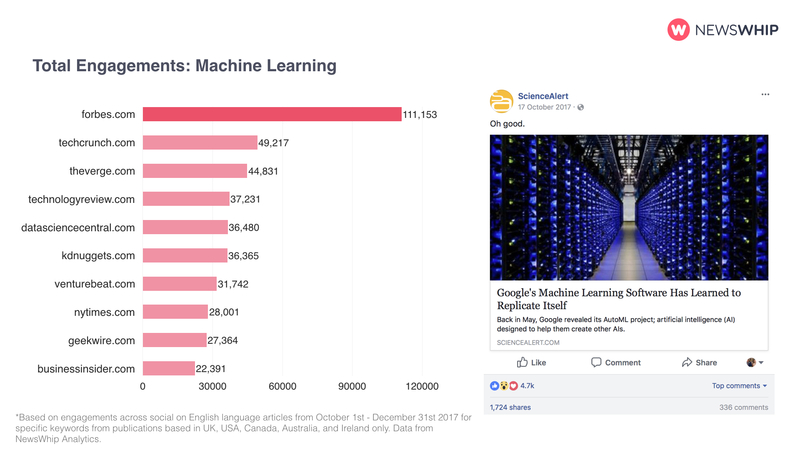 E.g., knowing that KDnuggets scores higher than the NY Times for social media engagements about machine learning can be a big deal if you work in that space (and that is not just a hypothetical – it is the exact scenario their system uncovered, as I shared). The graph below shows total engagements for machine learning topics. What forms of engagement does it cover? What is total vs. average engagement? This chart is a ranking of publishers based on the total engagements their web content about machine learning drove. Content can vary significantly in the online attention it gets; two stories from the same publication have no guarantee of achieving the same reach or level of success, so social engagement is a good way to benchmark how content is doing on a more granular level. This engagement comes across the social spectrum, and can be anything from a reaction/share/comment on Facebook, to a Twitter influencer share, to a pin on Pinterest. Total engagement is the sum of engagements across all the articles for whatever topic you’re looking at, while average engagement is the total engagement divided by the number of articles published, which gives an idea of the rough level of engagement you can expect on social. This fact that this graph is based on total engagement is part of the reason why Forbes is ranked at the top. Their average engagement is reasonably high, and they published a high number of articles on the topic. If we looked at average engagements per article, that might change the ranking a little. How does an article get in the ML “bucket”? Our data sources from headlines, subheads, keywords, and the metadata. We also have the capability to do a full text analysis, but we didn’t do that for this particular search. It depends what you’re looking for. If you’re looking for the impact of the average piece of content, then yes, average might be better. If you’re looking to discover niche websites you might not have been aware of to see who has an audience that is consistently engaging with the type of content you want to place in publications, then total engagements is a good way to do that. The Times is always going to have a high average because of the nature of the publication, but they may also only publish one article on it per quarter. If you can be that article that’s great, but it’s also about finding the best alternatives! Will you be looking at other content consumption metrics? We always have more things in the pipeline! We already track comments made on the Facebook post itself, and for native content we can even break down by reaction. As we said in the webinar, a simple view count doesn’t really count for much anymore, especially on social. What you want is an active audience, not a passive one that may be viewing and not taking anything in, which is why we principally have this focus on engagement data. Prediction is one of the key capabilities of our Spike product. 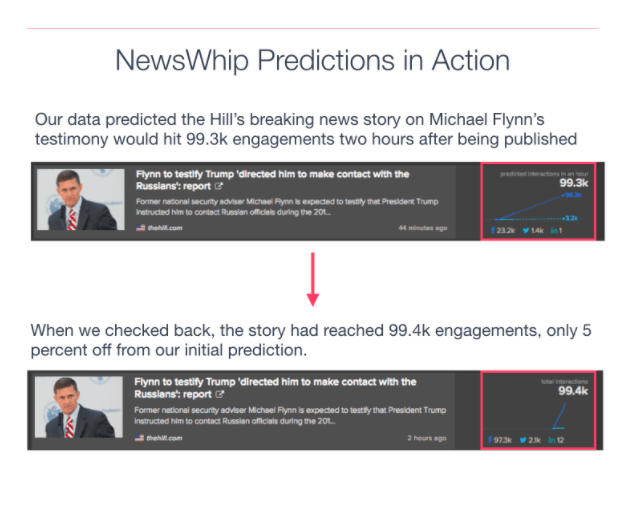 We use an algorithm to measure all the articles we’re tracking and make predictions about what level of engagement they’re going to achieve in the next x number of hours. So within a matter of minutes of publication, we’ll have an idea of what’s pre-viral, as it were, what everyone’s going to be sharing in the next few hours. As a publisher, or even a brand that has any kind of newsroom, you can use this to get ahead of the game, and make sure that it’s incorporated into your content schedule. Our Chrome extension has this same predictive capability and it’ll show you who’s been sharing it so far, but you’d have to already have a hunch about what’s going to be successful. It’s great for checking a hunch, but it won’t show you all the successful content on a topic like Spike does. Can this feature spot rising news stories to support PR newsjacking? It’s applicable in the same way. When I say “content,” I was counting news within that, so as you can see with that Flynn story shown, we were predicting it was going to be a huge story very early on, and it turned out to be just that. We can search by keyword, website, or Facebook page to see what’s predicted to be successful. So what Spike can help you do is make sure you’re the first to know about the next hot story, and by definition you’ll have a head start to get in touch with the relevant people because you’ll know about it before others. It can also do the opposite and tell you when a story isn’t going to be big and when it’s not worth making the effort! This entry was posted in PR Tech, Social Media, Tech, Tech PR, Technology and tagged engagement, media relations, PR, social media. Bookmark the permalink.